So what do you do when your long anticipated down-time with friends comes around on a rainy day? Well if you’re like our little group, you make lemonade from lemons, and head indoors to the wonderful Nicholas Conservatory and Gardens. And might I add, we were a diverse group to please – two fun-loving baby boomers, an avid gardener, three twenty-something gals (including one with a hunky new boyfriend), and the most adorable one-year old you have ever seen. Between us there was a manual wheelchair-user, a power wheelchair-user and a stroller mom, and believe it or not, Nicholas Conservatory and Gardens not only met all of our access needs, but it also offered us all a fun outing on a day that was severely lacking in the weather department. As far as access goes, there’s plenty of accessible parking with level access to the front lobby, and paved level pathways throughout the conservatory. There were a few places that had a step here and there, but there was plenty of room to turn around a wheelchair and navigate to a more accessible route. All in all, I’ll give them a thumbs-up in the access department. And as luck would have it, we visited during their Simply Spring butterfly extravaganza. This interactive exhibition features timed entry into a butterfly enclosure where visitors are surrounded by the colorful creatures. There’s ramp access to the enclosure and plenty of room to roll around to the plants where the butterflies land. Additionally, visitors are given a nectar stick, which attracts the multi-colored residents. Access wise it was a home run, and the volunteers didn’t even bat an eye at the two wheelchairs in our group. We spent about 20 minutes inside the enclosure and then we were free to explore the rest of the conservatory, which features a wide variety of tropical plants – or as I put it “everything that you can’t grow in Rockford”. All in all it was a great day for all ages and abilities. And I have to say that you just can’t beat the look of an inquisitive one-year old when a colorful Blue Morpheus lands on him for the very first time. In a word, it was priceless. 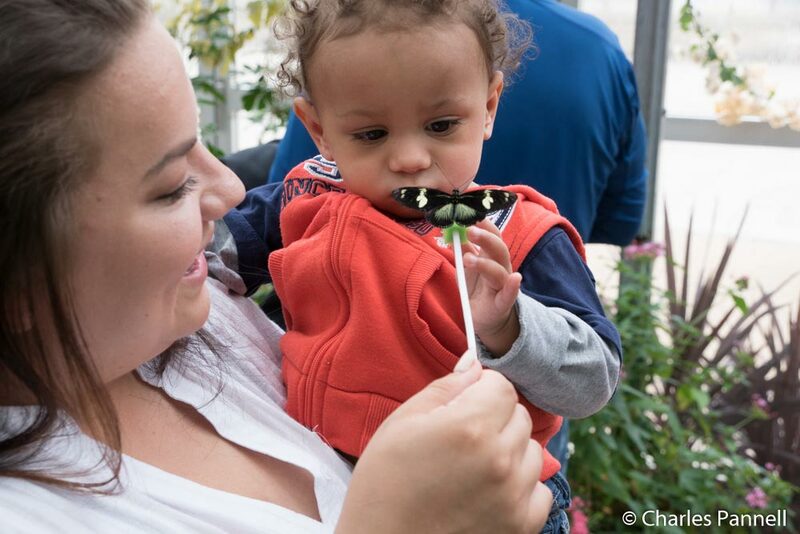 And although the conservatory is open all year, the butterflies will be gone by May 15, 2016. So shake a tail feather if you want to see them! I highly recommend it. This entry was posted in Attractions, Road Trips and tagged butterfly, garden, Illinois, Nicholas Conservatory, Rockford, stroller, trails by Candy B. Harrington. Bookmark the permalink.